We were asked to design and deliver an accelerated develop programme for the UK public sector to take people from middle management to senior leadership positions. The initiative was part of the cross public sector talent initiative and included people from most departments. Whilst all the participants were talented and had already achieved successful careers, most were at a crossroads. Could they go from being ‘mere’ managers and experts to being leaders of large, diverse teams where vision, strategy, engagement and alignment mattered most? The government departments were going through unprecedented change at the same time, so their leadership needed to be at home in an environment that was very fast paced, where the volume of work was exceptionally high and where people were experiencing challenging work conditions due to downsizing and a fundamental redefinition of success. There were many potential difficulties surrounding the success of the programme, not least getting buy-in across a diverse set of stakeholders and the concerns of the participants themselves. Some of the latter felt they were being pushed too hard but that turning down the opportunity to be on the programme would damage their career. They were also worried about how much time they would need to set aside to work on their own development since they also had very demanding jobs to attend to. A number of participants were moved to new roles at a more senior level before the programme had even finished. These concerns meant the programme had to address the leadership journey in the context of the challenges the participants felt. However, we’ll put these specific challenges to one side for the purpose of this case study and focus instead on the challenges related to applying new behavioural habits and how the programme design helped overcome them. The overall challenge of the programme, after all, was to engage the individuals in their own development and, most importantly, help them learn to learn so their leadership journey continued beyond the formal one-year programme. Since the programme had four modules as well as coaching, we were able to support and monitor participants’ progress. Participants were given the opportunity to update their new habit plan at each module if appropriate. The whole structure of the programme encouraged the identification of the new habits that would lead to success and also provided opportunities to start embedding the new behavioural habits during the programme. Much of this was done ‘behind the curtain’; we did not explicitly tell participants why certain activities were included and how they helped develop new habits, but the design followed our embedding model. The programme used multiple channels to develop insight, new behaviours, new knowledge and opportunities to practice in a risk-free environment. (We’ll cover each of the elements and how they helped to embed the new habits identified by participants.) This was an individual-centred process because we wanted each person to be able to work on the habits that would make the most difference to them specifically. Since the programme had four modules as well as coaching, we were able to support and monitor participants’ progress. Participants were given the opportunity to update their new habit plan at each module if appropriate. One of the things we know about developing a new habit is that people quickly become accustomed to having it and ‘forget’ how they used to behave. Whilst this is good in many respects it can rob people of their sense of achievement. Therefore celebrating success was one element we were careful to build into coaching and module content. We were also explicit about the importance of habits in the first module. We shared the neuroscience behind how habits are formed and changed, and we introduced the cue, routine and reward model. Participants then discussed with one another the new habits that would be most useful for them to develop. They came up with no shortage of new habits they identified that they needed. The challenge was to pick a habit which would make the biggest difference but which was relatively easy to adopt in order to encourage them from the outset. This was different for each participant, of course, because they were all at different stages in their leadership journey. 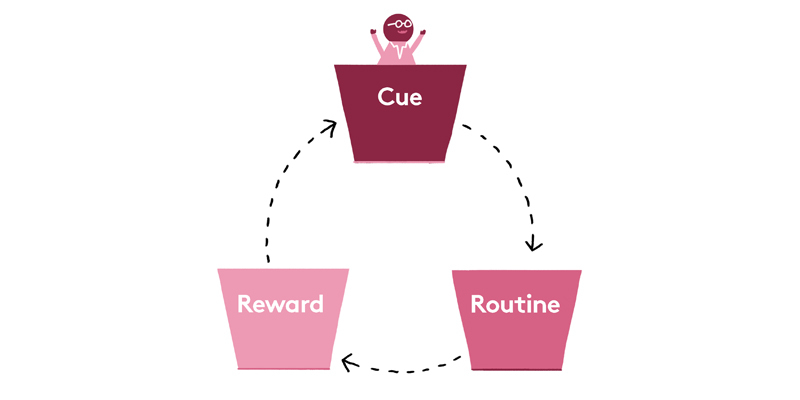 In terms of using the habit model, people found little difficulty in identifying the cue and the new routine. The difficulty lay in identifying the reward, and especially in identifying a reward that they could anticipate the pleasure of rather than simply trying to convince themselves that they found the new routine a pleasure in itself. We used the CORE model to help people identify the rewards that would work for each of them. We used the CORE model (see video) to help people identify the rewards that would work for each of them. So, for example, the reward might be about creating greater certainty or more options in their leadership style, or perhaps a greater sense of reputation or equity. Linking the two models had the added advantage of using CORE as a practical tool. Line managers: Each participant had consulted with their line manager, which reinforced the habit chosen and also provided an opportunity to get feedback and help with applying the new behaviour in his or her day-to-day job. Some managers took this very seriously, noticing the new behaviour, giving feedback on the difference it had made and praising the effort involved. Not all participants had a manager who was particularly interested or supportive. These participants identified colleagues in their Action learning Set or in their team who could provide support and feedback. Social learning platform: We supplied a social learning platform where participants could review additional materials, revisit the materials and models used in the face-to-face modules, report back on successes and struggles, and share experiences with colleagues. Participants were also able to form groups and share additional content they had found. The platform helped to keep the groups connected and active between modules and established a support and challenge group: they’d hold each other accountable for applying their habit plans when they went back to their respective jobs. The social learning platform worked better for some people than others, though. Younger participants were more open to using the platform and also more open about how they were getting on with their habit plans. However, we did see increased use as the programme progressed, even from the initially reluctant; one of our ‘behind the curtain’ design elements was itself to create the habit of using the platform by channelling useful and informative materials to it. For example, it was the only place to get access to pre-work for the workshop and supplementary materials like videos. The facilitators were also active on the platform, posting questions, making suggestions and encouraging participants. Long-term project: Participants proposed a project they wished to work on during the year and then in the final module presented their findings to senior leaders who were sponsoring the programme. The projects were an opportunity for participants to practice new behaviours. For example, one participant, who we’ll call Jon, had identified a new habit he wanted to embed. He was a highly intelligent and creative person who usually knew instinctively the solution to an issue and understood the organisation well enough to be able to identify what would be accepted and what wouldn’t. This had been the root of his success to date. He understood that whilst this made getting the job done fairly easy for him it tended to alienate others who ended up having either to go along with his ideas or actively resist them. Jon recognised that this style was not helping him engage his team and would almost certainly hold him back in the long run. His new habit, therefore, was to lead by asking insightful questions so that the group came to a creative answer together. In his coaching, Jon had identified that what stopped him doing this was a belief he was usually right and asking questions to get others to have the insight would take longer than just telling people the answer. So the first challenge was to deal with this belief that he usually had the best answer to a problem, or at least to find an opportunity to practice in a safe environment where the stakes were not too high and he could test whether his belief held true. The group he was working with on the work project on the programme was ideal for practicing this new approach. He adopted his new behaviour for the very first project meeting. It went well and this encouraged him to try the same approach with his team back in the office. By the end of the programme this had become an embedded habit. He no longer had to plan his questions or hold himself back from giving a solution when he needed the collective intelligence of the group or when he wanted buy-in. As his confidence grew, he added other elements to his habit plan that extended his range of leadership behaviours. Action learning sets: The group formed action learning sets that were another means of getting participants to work on and embed the new habits they had identified. These became a core support network for the group and one that continued after the formal programme finished. Coaching, mentors and sponsors: Each participant had a number of hours coaching over the course of the programme. The coaches used were also the facilitators of the face-to-face modules, so they were able to support and reinforce learning and behavioural change as well as help participants get over the occasional lapse into a fixed mind-set or old behaviours. Coaching was also useful in noticing change, both in coaching sessions and modules, and reinforcing and celebrating success. Each participant also had a very senior sponsor from a different department. The sponsor was a valuable resource as a role model and was able to unbundle their own behavioural habits they had developed and which had contributed to their success. Participants shadowed their sponsor on a ‘normal’ day and on a ‘tough’ day and then debriefed their mind-set and beliefs around the issues they had been dealing with during the day.